More than 120 singers will fill the stage when Northwest Repertory Singers and the Tacoma Youth Chorus combine talents for “Tacoma Sings: A Generational Collaboration” Saturday, March 8. This is the second time these two premiere choral groups have collaborated for a memorable evening of music. The concert is at 7:30 p.m. at Mason United Methodist Church, 2710 N. Madison St. in Tacoma’s Proctor District. NWRS and TYC will perform individual songs and then combine for several selections to close the concert. NWRS is a 60-voice choral group now in its 13th season. The high-school-age ensembles of Tacoma Youth Chorus include the Young Women’s Choir, the Young Men’s Choir, and the Chorale. The 69 young musicians are led by Judith Herrington, artistic director and founder. Dr. Schultz and Ms. Herrington will present a half-hour pre-concert lecture at 6:30 p.m. If you’re able, please considering bringing a food donation for the North End FISH food bank. Tickets are available from Brown Paper Tickets with no service fee or by calling 1-800-838-3006. Tickets are $18 general admission, and $15 for senior/student/military. Children under 12 are free. Tickets are also available by calling 253-265-3042. Information about Northwest Repertory Singers is available at NWRS.org, Facebook, YouTube and Twitter. Detail of 43rd Street Bridge mural at E. 43rd St. & E. C St. Artist: David Long. 2013. In support of the City of Tacoma’s ongoing efforts to combat blight and vandalism, the Tacoma Murals Project is seeking applications from artists interested in leading a mural, and from community groups interested in collaborating with local artists who will design and implement murals that reflect positive neighborhood themes or messages. The City is seeking adult artists or artist teams, who already possess strong artistic skills, to work with the community to design and implement high quality outdoor painted murals in select communities in Tacoma to fight blight and combat vandalism. Mural designs will be based on the lead artists’ aesthetics and based on input from the communities regarding themes or messages. Artists selected through this call to artists will be added to the 2014 Tacoma Murals Project Lead Artist Roster. Community groups approved for a mural in their community through the Tacoma Murals Project will select an artist for their site from this roster of artists, with a limit of one mural per artist. The City will provide mentorship to artists selected from the roster who do not already have extensive outdoor public mural experience. Artists selected from the roster will be paid at a rate of $30 per hour for mural meetings, design and implementation. Artists can expect to invest between 90 and 250 hours in their murals. Applicants must be professional artists, 18 years or older, and available to lead a mural in the summer of 2014. Applicants must also reside in Pierce county or have graduated from the Tacoma Murals Project as either an apprentice artist or lead artist between 2010 and 2013 and been added to the Tacoma Murals Project public roster. The deadline for artist applications is midnight on March 28, 2014. 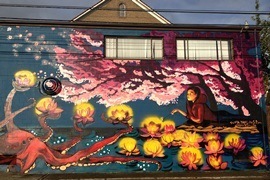 Tacoma Buddhist Temple mural at 1717 S. Fawcett Ave. Artist: Chelsea O’Sullivan. 2013. Photo by Chelsea O’Sullivan. The City is seeking community groups who would like an outdoor mural painted at a specific site in their neighborhood to fight blight and combat vandalism. It is tentatively projected that five mural sites will be selected for 2014. The deadline for community applications is midnight on April 4, 2014. 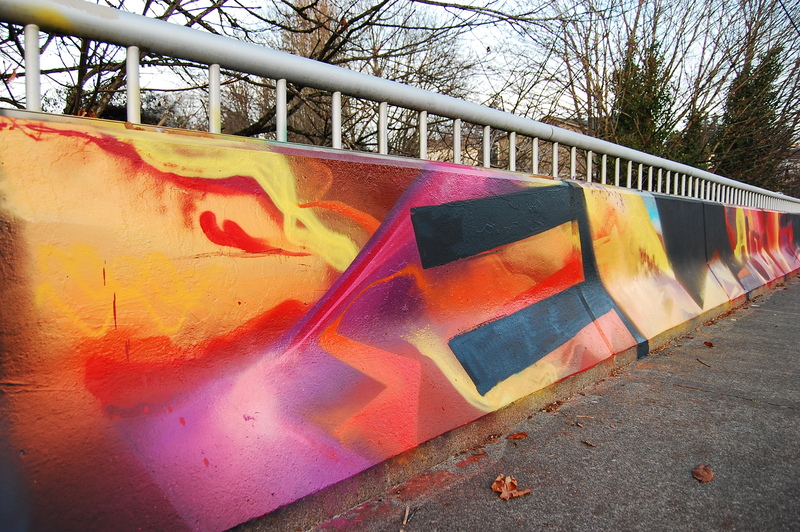 Twenty one murals have been completed between 2010 and 2013. To see photos of these murals, visit the Completed Murals page on the City’s website. More information about the Tacoma Murals Project and applications for both artists and community groups are available for download at cityoftacoma.org/artsopps. For additional information, please contact Naomi Strom-Avila at nstrom-avila@cityoftacoma.org or (253) 591-5191.